The map is showing the European continent with European Union member states, new member states of the European Union since 2004, 2007, and 2013, member states of European Free Trade Association (EFTA), and the location of country capitals and major European cities. 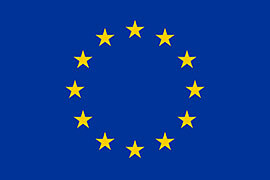 There are by now (2016) 28 27 member states in the European Union. Luxembourg (Luxembourg (French) Luxemburg (German) Lëtzebuerg (Luxembourgish)), Netherlands (Nederland), Portugal, Spain (España), Sweden (Sverige), and United Kingdom (on extended leave). became union members in May 2004. Bulgaria (България) and Romania (România) became union members in January 2007. Croatia (Hrvatska) became the 28th member of the European Union in 2013. Albania applied for European Union membership in 2009. Officially recognised by the EU as a "potential candidate country". Despite the fact that Iceland is already heavily integrated into the EU market, the country applied to join the EU in 2009. In 2013 Iceland's government paused negotiations with the European Union, due to disagreements in matters of fishing fees and tax cuts. Relations between Monaco and the European Union (EU) are primarily conducted through France. Norway is not a member state of the European Union, but is closely associated with the Union through its membership in the European Economic Area (EEA). The EEA comprises the member states of the European Union, except Croatia, plus Iceland, Liechtenstein and Norway. Serbia officially applied for European Union membership in 2009, the European Commission recommended to make it an official candidate in October 2011. Click on a country or city name to open the respective information page. Political Map of Europe showing the European countries. 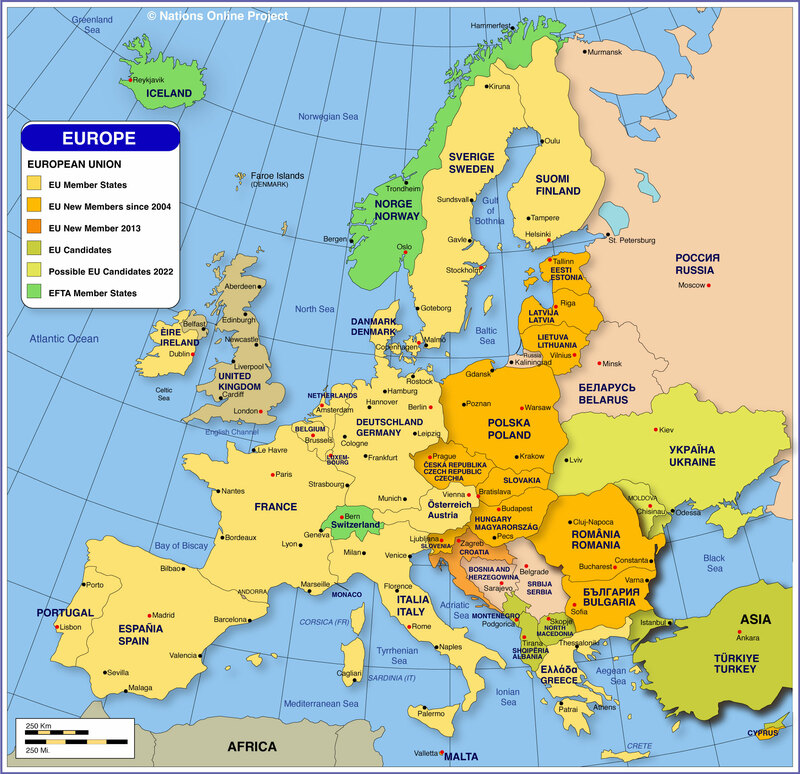 Maps and information for all European capitals. Countries of Europe with population figures. Political map of Europe's far east. Political map of the Mediterranean. Which language is spoken in which European country? Europe is the 2nd smallest continent after Australia. Mainland Europe is geographically actually a great big peninsula, the western part of the Eurasian supercontinent. The European continent, despite it has no clear geographical or geological boundary in east, is by convention 'separated' from Asia by the Ural Mountains, the Ural River, the Caucasus Mountains, in south east by the Caspian Sea and the Black Sea (see Map of Asia, with the soft border between the continents). In south the Mediterranean Sea separates Europe from the African continent and its western borders are defined by the Atlantic Ocean and to the north by the Polar Sea. The northernmost point of mainland Europe is on the northern tip of the Cape Nordkinn peninsula in Norway, its southernmost point is Punta de Tarifa on the Atlantic end of the Straits of Gibraltar in Spain, and its westernmost point is at cape Cabo da Roca in Portugal. Europe is roughly divided into the geographic subregions of Central Europe, Eastern Europe, Northern Europe, Southern Europe and Western Europe, as it is used by the United Nations region classification. For a list of countries in this regions see: Countries of Europe. By the way, in the United Kingdom the term 'Europe' used to refer to all of the continent except the British Isles.